Nursing is a career which is incredibly rewarding. Nurses make a difference in people’s lives and encourage health and wellness. They are witness to the miracles in life and provide help and compassion to their patients at life’s hardest moments. Like most people, nurses strive to provide good service and care in all aspects of their lives; from work and family to their health and relationships. But striving to manage all these things can often lead to stress and burnout. A recent survey by Harris Interactive showed that 60% of the healthcare workers interviewed stated they are burned out on their jobs. 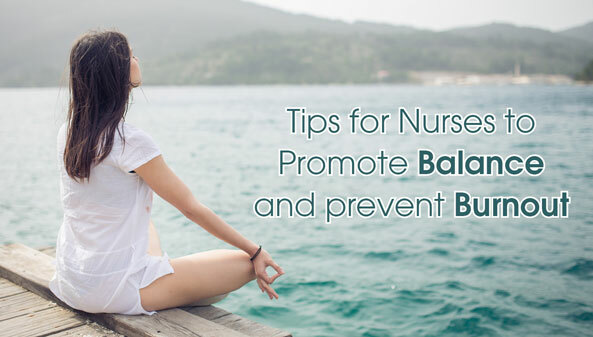 This year’s theme for Nurses Week is focusing on balancing Mind, Body, and Spirit. Check out these tips to encourage better work/life balance to help keep burnout and stress at bay. Nurses love to care for people and make them happy. This can often make it hard for them to say no to something that is asked of them. But in order to have a balanced work/life, it’s important for nurses to sometimes step out of their comfort zone to say “no”. People cannot do everything or take on every project. Doing so will only add additional stress which will often lead to burnout. Nurses should eat right and not skip meals or abuse their bodies with rigid diets. Choosing nutritious foods will fuel the body for long shifts and positively impact energy levels and overall health. Time should also be scheduled into every week for regular exercise. Whether it’s going for a run, participating in a relaxing yoga class or just a walk around the block to decompress, take the time to get your body moving. Exercise is not only good for your physical being, but it also serves as a great stress reducer. It sends feel-good endorphins through your body and helps lift your mood. People who take the time to exercise feel less stress and are happier. Schedules are oftentimes so jam-packed full of obligations there’s no time for anything else. Build time into your schedule to do things that you enjoy. Work on the hobby you haven’t made time for. Cook a meal with your spouse or simply make time for a relaxing bath. Even if it’s just 10-15 minutes to start, having that time to recharge your batteries will bring more happiness and help restore the work/life balance. Take time during the day to slow down and disconnect. Go for a short walk, sit on a bench outside or just listen to music for a few minutes. Taking a small amount of time during the day can help clear your mind, reduce your stress and allow to you better deal with the duties of your day. Many people waste their time on activities that add little value to their lives, often without even realizing they’re doing it. Habits like checking social media, email or headlines often waste precious minutes that will quickly add up. For example, spending time with a chatty or gossipy co-worker will sap the time that could be spent in a more meaningful way. Take stock of the small things that add little to no value to your day and eliminate them. Assisted is an award-winning provider of Home Healthcare Services throughout Southern California and Arizona. For questions or to learn more about Assisted and the services we offer, call 800-949-6555 or visit us at www.assisted1.com. This article was posted in Home Health Care and tagged Home Care, Nursing.